I have recently become acquainted with a bird dog trainer extraordinaire by the name of Ben Garcia (Yes, he looks young…but man can he train gun dogs!)! He has trained several of my clients’ dogs over the past couple of years, but we had never formally met until recently! Ben’s clients only have the utmost positive things to say about him and his gentle dog training techniques. Ben has been polishing up Walter’s Pride the past few weeks getting her ready for the up and coming bird dog season! Walter and I are headed for Colorado sage grouse country this weekend to turn Pride free on those Purple Bombers! I can’t wait to watch her float across the sage brush prairie! 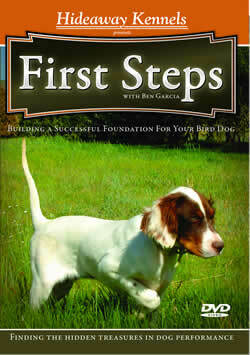 Ben recently released an excellent DVD on low stress training for both pointing and flushing dog breeds! (Please Click Here For More Info on Ben’s Website and DVD) I eagerly watched his DVD last night and was instantly impressed with Ben’s techniques and dog savvy! 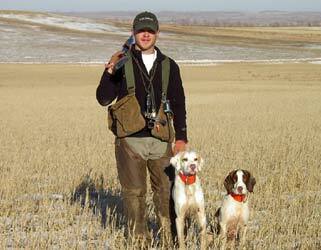 I would recommend First Steps to my clients and bird dog hunting partners! Ben’s a confessed fellow pointing dog ADDICT with English Setters at the four (as in paws) front! Congrats Ben and I can’t wait for the next bird dog training DVD! Previous Post >Excellent Article on Strideaway!